Do you need to save money and therefore cant afford to buy the traditional mattress and bed? Do you like camping, and would like a comfy portable bed for your camp nights? Do you want to invest in a mattress that’s comfortable, long-lasting, and pocket friendly? If you have answered yes to all the questions above, then the Coleman QueenCot with Airbed is what you are looking for. You will feel no difference between this bed and your usual bed, no matter where you are using it. Since the bed is raised high, you will be shielded from the coldness or dampness of the ground. This makes it great for seniors who rely on tracking hoists to get in and out of bed. If you are going camping with the bed, the raised height will ensure you are protected from crawling insects. The Coleman QueenCot mimics a traditional fancy bed. Each side features a side table that you can use to hold loose items like glasses, books or drinks. The air bed is as convenient as a traditional bed with extra side tables, only here you get it as a complete package and at a friendlier price. The bed allows you the luxury of carrying with you everything you love indoors for your outdoors adventure. The Coleman QueenCot with Airbed comes with a 4D battery air pump that enables it to self-inflate and deflate. This makes it easy to manage the whole cot. The beds foldable steel frame can be easily manipulated to fit a storage bag for easy transportation. The QueenCot has been tenuously designed with a thin cotton sleeve on its top. This makes the mattress more sturdy and slip-free as you sleep. It is clear that the bed is both comfortable and strong. 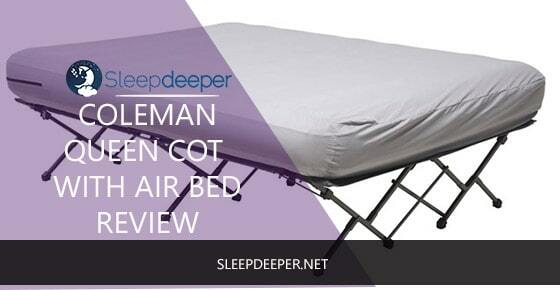 The main design foundation of the Coleman QueenCot with Airbedis its durability. To begin, the cot has an excellent quality frame thats incorruptible and can withstand weight of up to 600 ponds. This means two grown adults can comfortably share this bed. Many customers have praised this bed for its strength that has seen them using it for years. Another feature that customers love is the ability of the bed to stay firm over many hours of use without the need to top up the air. Most users said that they only needed to top up the air on days when the bed was used for extended periods. This is because while the airbed is comfortable while being used, it will tend to create more space for air. This airbed is 59 X 72. This sleeping space is enough for more than two people. Further, you can separate the cot from the mattress to create more space when needed. Two people can comfortably sleep on the cot using sleeping bags and two others use the air mattress. So, even though you are paying for a mattress for two, in reality you are getting enough sleeping space for four people. 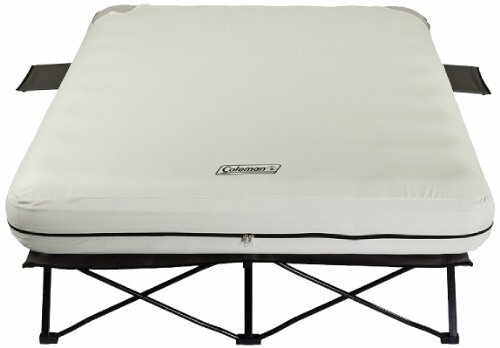 The Coleman QueenCot with Airbed is by all standards an excellent choice for both outdoor and indoor use. You cant go wrong with this bed if youre looking for is a comfortable, spacious, long-lasting bed and affordable air. There is only one drawback with this bed: its cumbersome to carry if you are moving a lot on foot.